Happy Bloggers Challenge Friday, I'm glad you stopped by today! This weeks Bloggers Challenge Theme is Bags or Boxes. Using your Big Shot with material has become pretty popular these days, not only is it quick, but makes great projects! Long before I ever got into stamping I use to sew, not on a regular basis, but I none the less I could sew. I took sewing lessons as a child, and later put those skills to use creating patchwork Christmas Tree Skirts, Crib Dust Ruffles and my boys Halloween Costumes. These days for the most part, I generally just mend items, nothing major. Well thanks to the Big Shot and come wonderful dies, I've created todays project! I used Spellbinders Square dies to cut the squares for my patchwork, and Stampin' Up! Fancy Favor Box Die for my basket, I think it took me longer to turn my handle inside out, than it did to create the entire project. After my squares were all assembled, I used the Fancy Favor Die to cut my Box. I also cut one from some quilting material for the inside of the basket. Sewed my pieces together, sewed the side, than hand stiched the bottom closed. The handle is attached to the side with two buttons. Makes a cute little Easter Basket, don't you think? Looking for more Box and Bag inspiration? Click on the Bloggers Challenge Logo on my sidebard to see what the other players created this week. Adorable project Lisa - love the fabric you chose! I'm so jealous of people who can sew. I just really feel like I have no talent in that arena! Cute basket! Darling basket! I love the patchwork look to it. Amazing what we can do with fabric and the Big Shot! This is adorable! I've made a couple of the rag quilt purses, but sewing really scares me!! A LOT!!!! You are multitalented!!! Great project- maybe I'll have to make one of these afterall!!! Lisa, is this cute or what??? YES!! It's darling. What a great little basket. Love this cute little Easter Basket!! The patchwork is awesome!! Yes it does make a cute basket. How fun and I agree with the Lisa who said she was jealous of people who can sew (I'm not so talented in that area). What a cute idea! It looks like i'm not the only one catching the sewing bug. This is beautiful Lisa! I would never have even tried this! Great idea and very clever way to think outside the box. I love it, but it's one I definitely will leave to you! This is just awesome! Add another talent to you long list!!! Fantastic Easter basket! Uh....YEAH!! 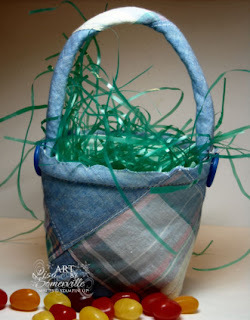 Super cute Easter basket Lisa! I love how it turned out! Wow! Lisa, this is adorable! I've really got to get my sewing machine going again! That is really cute, how clever of you! Great basket. You are really talented. Wow!!! This is too cute! I love the patchwork! Have a great week! What a wonderful project you created. I was able to post my version of the challenge just under the wire. You can view it on my blog. What a fabulous little basket! Great way to use all of those dies.